Far from a vegetarian myself, I ended up eating probably half or more of my meals vegetarian. Because in Ethiopia, just like in India, when it comes to vegetarian and vegan food, Ethiopia knows how to do it well. 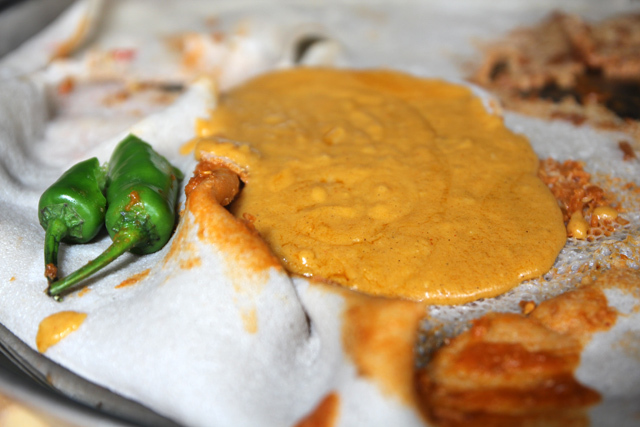 One of the Ethiopian food staples, in both vegan and non-vegan cooking, is shiro wat. It’s a curry or stew made from ground chickpeas flour – so basically it’s what I would call a bean paste – and it’s so flavorful. Vegan shiro wat is cooked with a little oil, a blend of spices, onions, garlic, and ginger. It’s creamy like a hummus, beautifully flavorful, and very healthy. Another omnipresent Ethiopian dish that’s almost certainly available at any restaurant serving vegan food is misir wat, or red lentils curry. The lentils are simmered along with the mixture of spices (berbere), onions and garlic, and olive oil. Again, it’s a winning Ethiopian vegetarian food that’s not only healthy and protein rich, but it’s really tasty. There are plenty of other wats (curries or stews) that utilize yellow peas, all sorts of different legumes, mung beans, and the full spectrum of legumes. Gomen is collard greens, a vitamin packed healthy green leafy vegetable. It’s extremely common in Ethiopia and nearly always makes part of a mixed platter. The vegetable is normally cooked quite plain, sauteed in a little oil with some garlic. 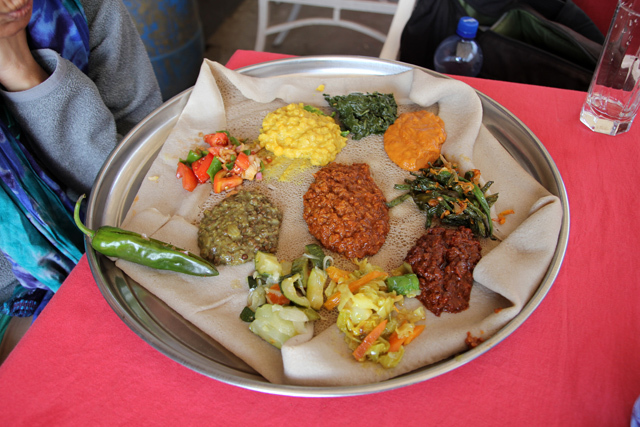 Other vegetables that are frequently consumed in Ethiopian vegetarian food include cabbage, beats, potatoes, carrots, string beans, tomatoes, and jalapenos. Another thing you’re absolutely going to love in Ethiopia is the salad. Many of the mixed Ethiopian vegan food platters (yetsom beyaynetu) will include a portion of tomato salad (timatim salata) as one of the dishes, but if not, you can ask for it (they don’t always have it, but it’s worth a shot). Whenever I could get tomato salad, I would order a huge bowl of it. Diced tomatoes, red onions, and slices of jalapeno, dressed in nothing more than salt, lemon / lime juice, and a drizzle of olive oil, then scooped up with pieces of injera is an amazing flavor. I loved it! At Kategna restaurant in Addis Ababa I also loved their mixed salad, a huge clay pot loaded with ripped pieces of napa cabbage, tomatoes, onions, jalapenos, and dressed in the same simple and marvelous dressing. 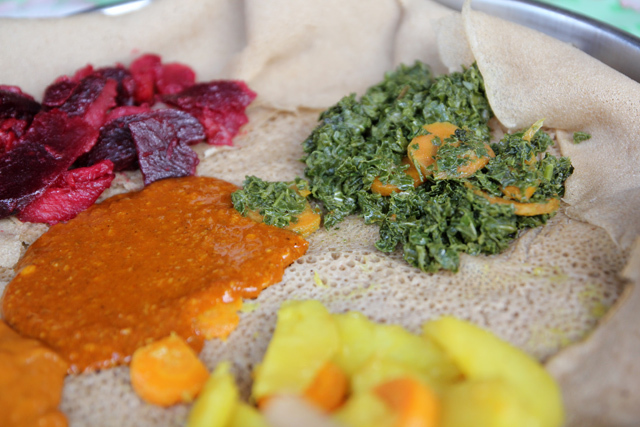 Fitfit is a popular Ethiopian food that includes pieces of injera that are soaked in lemon juice and olive oil, mixed with some berbere seasoning, and eaten as a full meal, or on top of a combination platter of injera. You could almost call it marinated injera. 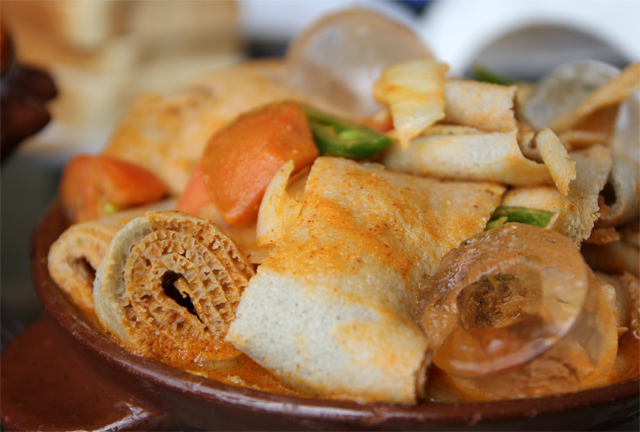 It’s easy to eat and makes good use of day old injera. 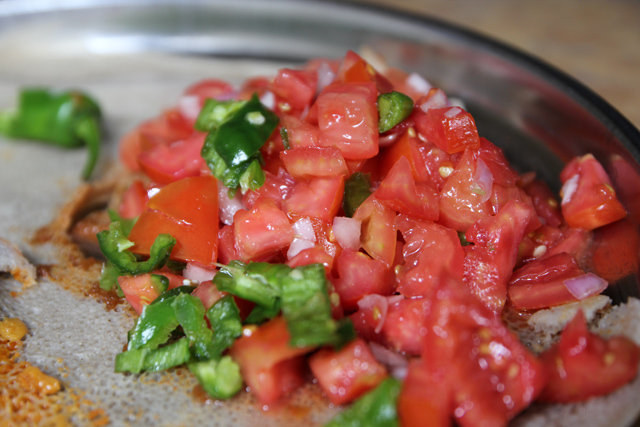 There are often a number of fasting versions of fitfit, such as shiro fitfit (fitfit) or timatim fit fit (tomato salad fitfit) that both cater to vegetarian eaters. I personally prefer solid injera with a spread of curries on top, but there are many locals that enjoy fitfit from time to time. 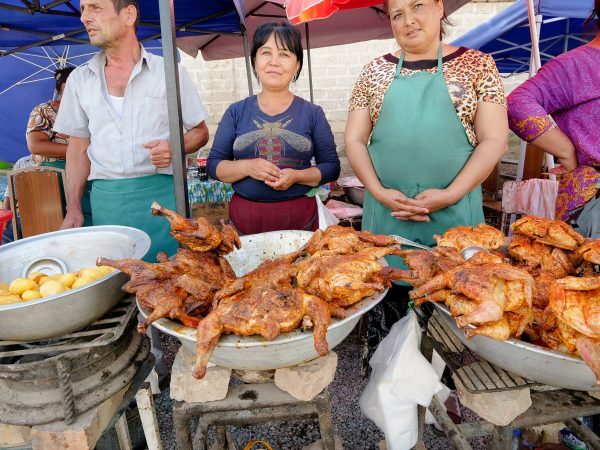 It’s also a popular breakfast dish throughout Ethiopia. 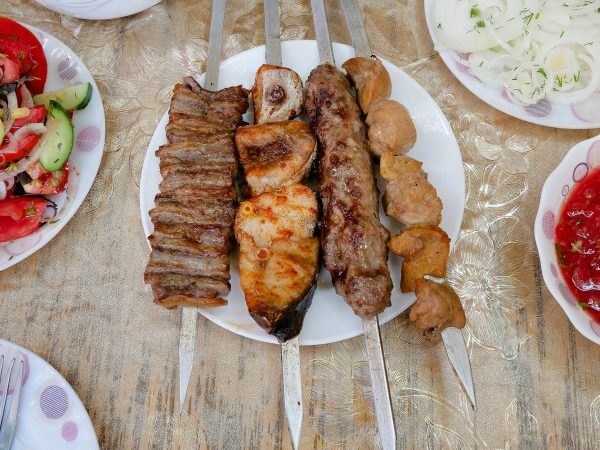 Like I already mentioned above, I’m not vegetarian myself, though I do enjoy eating healthy, and I thoroughly enjoyed numerous vegetarian meals while traveling in Ethiopia. But one thing is certain, if I ever did become vegetarian, I would be happy to live in Ethiopia. 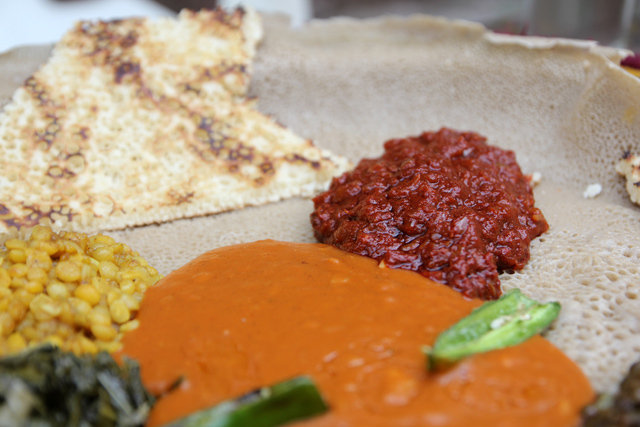 Ethiopia has one of the few cuisines where you can find healthy vegetarian dishes, packed with flavor and loaded with spices, without the addition of animal flavorings. 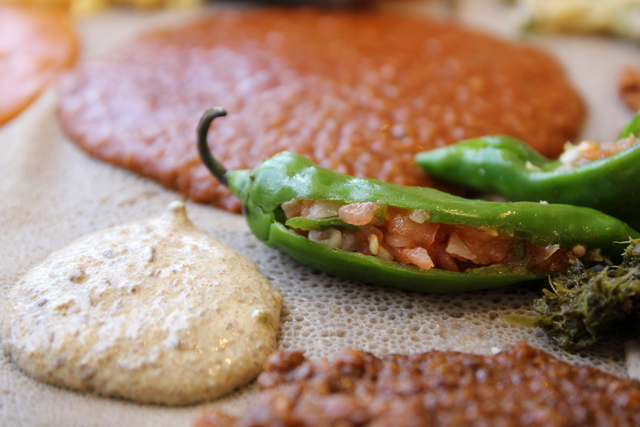 Now that you are armed with the knowledge of these delicious Ethiopian vegetarian foods, you’ll have no problem ordering up a satisfying “fasting feast” (I know that sounds a little ironic) that you’ll feel great about! I love Ethiopianfood but I found out almost all the Ethiopian restaurants in Washington DC do not use olive oil- they use corn oil which in the US is genetically modified. This completely negates the “health” benefits. Excellent information for vegetarians who wish to live in Ethiopia. hi, I am a vegetarian and in Ethiopia since months.. Its hard to find vegetarian food on non fasting days.. The split peas that prepare shiro is most often grass peas which are neuro toxic.. my advice when in ethiopia vegetarians need to survive on raw salads and fruits.. Avocados are a plenty and that is the saving grace..
Hey Franca, it’s a grain that’s really only eaten in Ethiopia and Eritrea. Hope you can visit, amazing food! Teff is also available in the US. 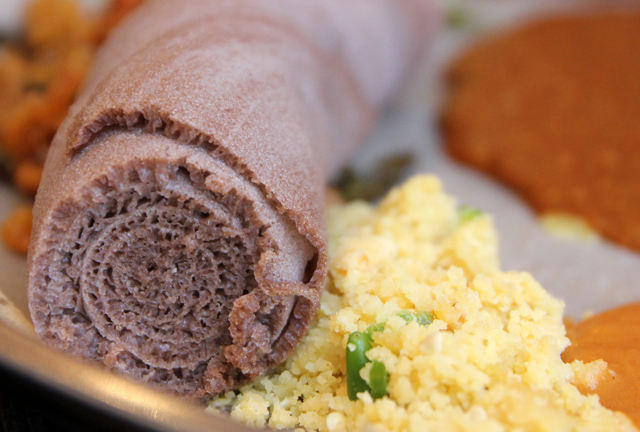 Depending on where you live Franca, Ethiopian restaurants have injera. 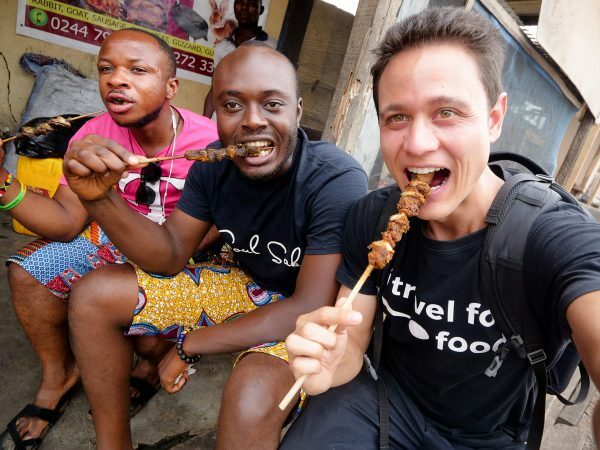 “But one thing is certain, if I ever did become vegetarian, I would be happy to live in Ethiopia.” I couldn’t agree with you more Mark and it’s still ironic why many Ethiopians are obsessed with meat while having such a wonderful delight which everybody envies to. Thanks anyway for sharing and keep on inspiring. Hey Jonny, that’s a great thing to live off! Yum! 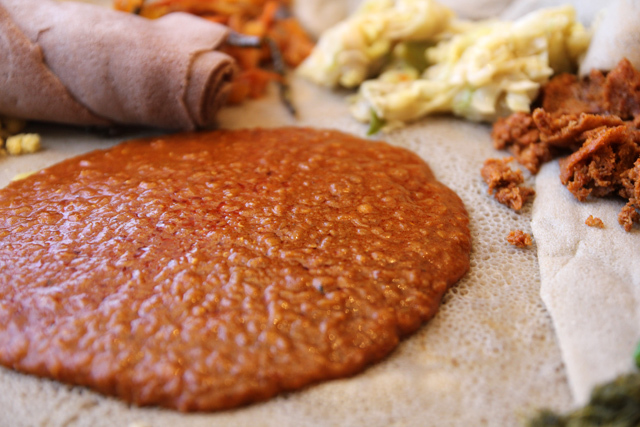 I first tried injera at an African restaurant in Melbourne and loved it – soaking up curries with its fluffiness is divine. Excellent, glad you’ve had Ethiopian food Rebecca! The Veg food look oh so Indian, more like a Dosa with the fixings, the Chili is no jalapeno, more like a Serrano. Food looks interesting indeed. Must be a few Indian around the place for sure. Maybe some Fusion food. Pretty cool. Hey Nash, yah, it’s a huge meal, and so tasty. Some of the curries definitely taste a bit like Indian! No fusion at all. This authentic Ethiopian food. It’s more likely that Indians took some recipe from Ethiopia. There’s a fab Ethiopian restaurant down the street from my apt. I’d be there daily, if I could. Yes, daily is a great idea! I absolutely adore Ethiopian food! 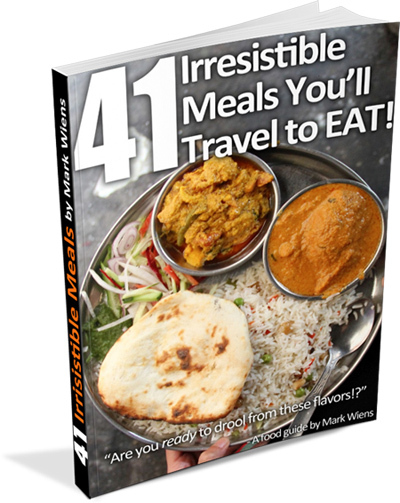 Ethiopia is at the top of my list for my 2015 travels, and although I’m a confirmed carnivore, I’d have no trouble giving up meat for a couple of days each week. Bring on the injera. Hey Tom, glad Ethiopia is on your list, it’s a beautiful country. I agree with you when it comes to meat, but this veg platter is amazing!